New Police Story: Best Jackie Chan Film in Years! Beijing, Sept. 27 (Xinhuanet) -- Jackie Chan's latest screen action film 'New Police Story' has pocketed twenty million Yuan ($2,419,374 US) in its first three days. It claims the No.2 box office this year, tightly followed Zhang Yimou's martial arts epic House of Daggers. Critics say this it's Chan's best action film in recent years. Over 400 copies of the film have sent to cinemas around China in anticipation of large audiences over the weeklong National Holiday. Click Sarah's t-shirt, above, to see all the new designs! Click Katie's coloring project, above, to see all the new ones! More postcards are going to be posted as soon as possible. New Police Story is #1 at Box Office! 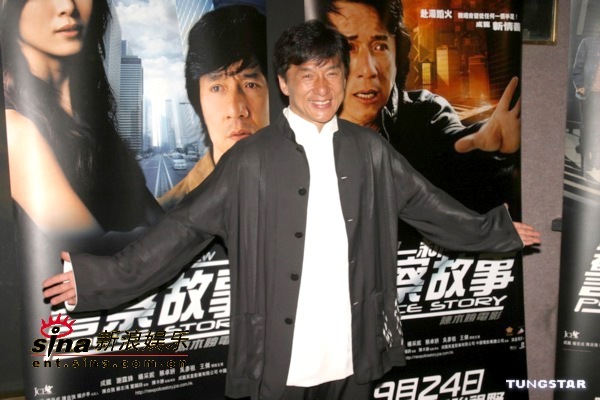 SING TAO - Jackie Chan's new flick "New Police Story" is strong in the box office. Yesterday the film premiered in 5 countries: Hong Kong, China, Singapore, Malaysia and Thailand, raking in nearly HK $10 million. Hong Kong alone generated HK $1.5 million, making it first place in the whole country. Currently filming in Lanzhou, Jackie's heart skipped when he heard the great news. "I had a hunch already. This means spending several millions to launch premieres was worth it. According to numbers of Asia's box offices, I estimate we will make money after one week. Thinking about this makes me unable to sleep!" 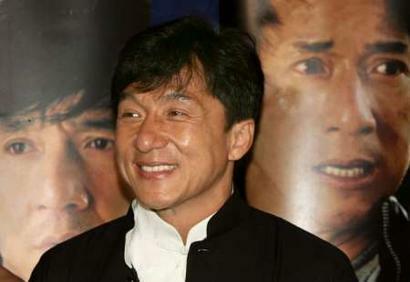 Recently Jackie has been complaining to the press that Hollywood is not the place to be for Asian actors. They are often given predictable roles which don't allow any creative freedom. Jackie is happy to be back in Hong Kong where he can put his talents to good use. He is looking toward a future as an ACTOR and not an action star. Maybe when Hollywood sees what Jackie can do when he's given more freedom they will allow him to make the kinds of movies he wants to make. Click on the microphone to see a clip from Channel I News (Asia). Critics and Fans Alike Love New Police Story! Jackie's newest Hong Kong film is opening to really great reviews in cities all over China. Critics are saying that New Police Story combines the best of action and acting. Congratulations to Jackie! Click here for more photos from Sina! 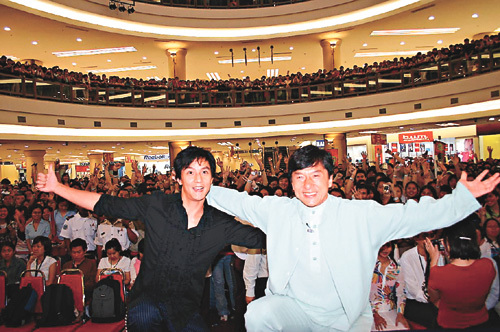 Here is a video of the Hong Kong premiere of New Police Story. Don't forget to check back here over the weekend. The Kids Corner webmaster has a SLEW of stuff to put up on the website including awesome new t-shirt designs, coloring projects, and postcards! To see tons more photos from the premiere, click here! New Police Story Getting GREAT Reviews! 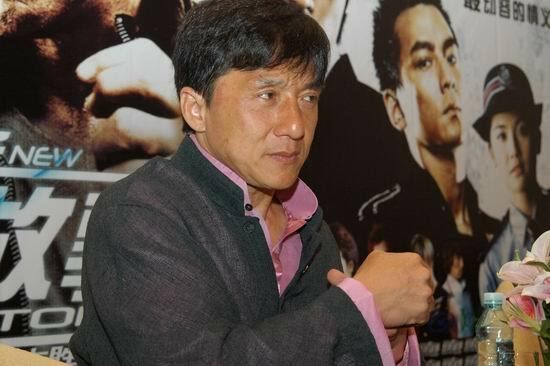 So far the buzz has been totally positive about Jackie's latest Hong Kong movie, New Police Story. Click here to read a great review from The Straits Times Asia. 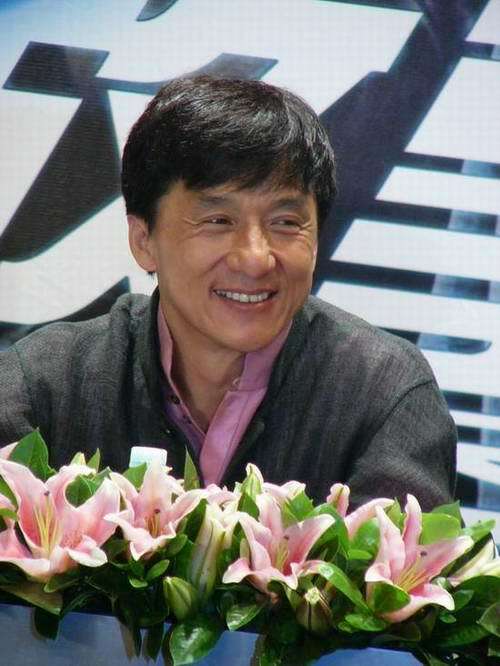 Congratulations to Jackie and the cast and crew of New Police Story. Let's Get the Story Straight, Okay? Some very irresponsible "journalists" have recently misquoted Jackie with regard to comments he made about his son Jaycee's recently released music CD. They have accused Jackie of making some very unkind statements about Jaycee's music. Please keep in mind that through the combination of poor translations and the unprofessional behavior of some journalists, Jackie has been wronged. These stories have taken Jackie's words and twisted them to try to create a scandal where none exists. To get the REAL Jackie news, stick to the official website. Kids Corner Computer Has Finally Arrived! Yes, it's been a tough couple of weeks, but all is in order now. The website's server is fresh and new (and FAST!) and the Kids Corner webmaster has a brand new Dell computer to help her bring you the best of Jackie Chan. Right now, there is a backlog of work for the webmaster. There are postcards and t-shirt designs and drawings that all needed to be added. This will be done ASAP - most likely over the weekend. Thanks for your patience. Really. Why is the Kids Corner Webmaster So Sad? New Police Story: Beijing Press Conference Photos! 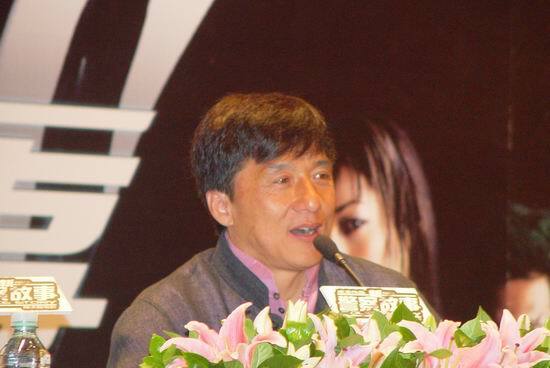 Jackie is honored by Beijing University for his support. You HAVE to see the newest designs for the t-shirt design contest sent in by seven-year-old Katie and her four-year-old sister Sarah. They are just REALLY WONDERFUL!!!!! They are so wonderful that the Kids Corner webmaster was nearly struck speechless when she saw them. Click the t-shirt below to see the new ones! CLICK THE T-SHIRT TO SEE THE LATEST ENTRIES! Lots of new photos have been added to the Kids Corner Myth pages. Remember, there may be "spoiler photos" included. 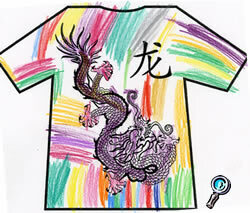 Kids Corner T-shirt Design Contest Has Begun! Thanks to Silvia for kicking off the contest with a beautiful t-shirt design. Silvia used a computer to make her design, but you can use crayons, paint, colored pencils, or whatever you like! Click here to see how to add your design to the contest! 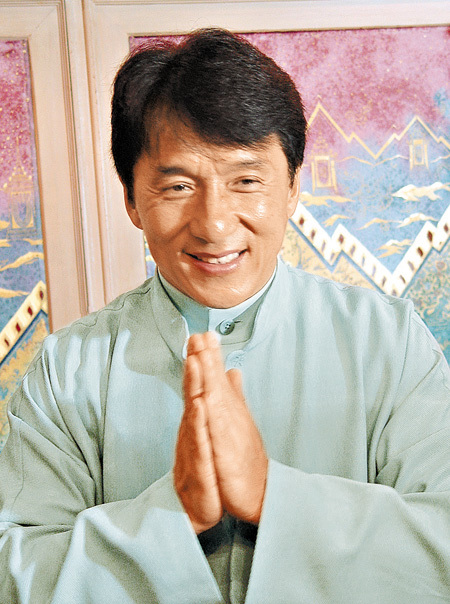 Jackie to Star in Television Show!? BEIJING, Sept.14 (Xinhuanet) -- Renowned Chinese action star Jackie Chan will co-star in the TV series "Silver Times" alongside other big shots from the Chinese mainland, Taiwan and Hong Kong. The youth drama is set at the Beijing Film Academy, and tells interesting stories about the college's Acting Department. China Radio International reported Tuesday. Film stars and directors that graduated from the university are also expected to be included in the lineup, such as Zhao Wei, known as "Little Swallow" for her role in "Pearl Princess," actress and director Xu Jinglei, and popular filmmaker Feng Xiaogang. The twenty-something South Korean singer Jang Na will portray the show's heroine. The Kids Corner is Back !!!!! It has been a long five days since the Kids Corner server suddenly went KAPUT! and knocked www.jackiechankids.com offline. In case you don't know, the SERVER is the thing that sends the website out to the Internet. The Kids Corner does not use the same server as www.jackiechan.com and that is why it was just this site that wasn't functioning. Hopefully this will never happen again, especially for such a long period of time! If you ever come to the Kids Corner and get an error message, don't worry. Sometimes technical difficulties come up with no warning. The Kids Corner is HERE TO STAY! Thanks to everyone who sent emails to the webmaster expressing concern (or alarm). All is well. In the last few days, the Kids Corner has received lots of baby photos, Buddy Bears, and "I Want to Be A Jackie's Kid" applications. Thanks to everyone who has sent these things in. It will take a few days for the Kids Corner to catch up to what has been going on with Jackie. So have a little patience and the Kids Corner will deliver all the fun stuff you're used to seeing here! Don't forget about the t-shirt contest (see below). In case you had any doubt about whether it was worth it to join the Jackie Chan International VIP Club, this should ease your mind. VIP members can get their own New Police Story t-shirts at a very discounted price. Click here to join up! Click on the newsletter to see the latest Little Dragon News. There are lots of really neat things to read about. You can either read it online or print out your own copy (and copies to share with friends). The Buddy Bear Second Edition book is on its way to Jackie! Since the crew is filming in a remote China countryside, Willie decided it would be safer to send the book to Hong Kong and then have one of the staff bring it to Jackie when they travel to the movie location. So have patience - eventually Jackie will see the book. Stay tuned for news about the Buddy Bear book. Very rarely do I put personal notes up here on the Jackie Kids Corner, but I just had to do so now. I want you all to know that the Second Edition Buddy Bear book is really special. It is a large, high-quality scrapbook with a red linen cover. It contains 116 Buddy Bear designs from Jackie's fans all over the world. There are bears from England, Scotland, Singapore, Germany, South Africa, Poland, the USA, and other countries. It's amazing! Each buddy bear was carefully cut out and mounted on a page (two to a page) and the artist's name, the title of the bear, and the country where the artist lives was printed right below the bear (thanks to Lisa S. for suggesting that the country name be included). Each page was adorned with beautiful cancelled postage stamps from all over the world. These stamps came from mail which was sent to the Kids Club/Kids Corner over the past 2 years. The result was GORGEOUS! I can't stress enough how beautiful the book looked with its unique and creative designs on each page. Of all the projects I've sent to Jackie, this one I am most proud of. And that's because of YOU! Your respect for the message of the Buddy Bears and your love for Jackie came through in each design. You should all be proud of yourselves. You've helped create a unique and meaningful gift which will certainly put a smile on the face of the man who has given us all so many smiles. Thank you for that. A whole bunch of new photos have been added to The Myth pages here at the Kids Corner. Click here to see the latest. Word from Buddy Bear Central in Berlin tells us that the Buddy Bear Exhibition is on its way to Istanbul, Turkey! The bears will be on exhibit from November 20th to the beginning of January. After that they head for Tokyo, Japan where they will be arriving sometime in March or April, 2005. Keep your eyes open wide - the Buddy Bears may end up in YOUR hometown sometime in the future! Don't forget that the Kids Corner has its own chat room now. A link to the chat has been added to the Kids Corner home page. Jackie takes a break on location for The Myth. The set of Jackie's newest film, "The Myth," has been closed for the duration of the shoot. However, a bunch of new photos of the desert location can be seen here! Jackie's diary has been updated and new photos and information about "New Police Story" have been added for viewing by VIP members. Also, if you were a Kids Club member, your free one year membership to the VIP Club is set to expire soon. You can renew your membership for a VERY reduced fee here. Click on the poster above to see a video from Chinese television about the making of the movie. There are spoilers in the video. Click the dancing movie camera to see the video! Many of you have already sent in the form for "I Want To Be A Jackie's Kid" and that's great! What isn't so great is that many of you have not sent a photo with the form. If you don't send a photo of yourself, your story will not be considered. Also, many of you have written one or two word answers to the questions on the form. The more you write, the better your chances of becoming a Jackie's Kid. The webmaster cannot use your story if you don't give enough information. So WRITE MORE! And send a photo! Thanks. Calling All Kids! Jackie Needs YOU! Each month the Kids Corner features one of Jackie's young fans in its Little Dragon News. 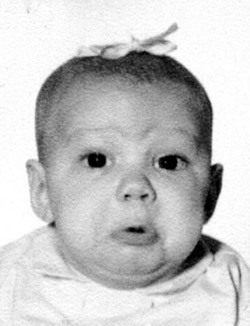 If you would like to be a Jackie's Kid, all you have to do is click here to fill out the form. You will have to send your photo to the Kids Corner in order to be featured in the Jackie's Kids Column. All the info can be found on the form! Hong Kong actor Jackie Chan receives an urn containing soil from the ceremonial tomb of China's first emperor Huangdi near China's ancient capital Xian, Shaanxi province, August 28, 2004. Jackie Chan led thousands of mainland and overseas Chinese to make offerings to China's first emperor Huangdi at an annual ceremony on Saturday. "Yesterday Jackie Chan and Leung Ka-Fai arrived at Xi'an's The First Emperor's Terra-Cotta Soldiers and Horses Museum to shoot a few scenes for The Myth. According to Hong Kong paper Sing Pao Daily, they played two archeologists, who were arguing about something inside pit 1 of the museum. The museum was built on a series of pits, where thousands of terra-cotta figures have been unearthed and thousands more are still waiting for excavation. The burial pits are part of the China's First Emperor's mausoleum. The filming only lasted for less than a day and it involved no actions. 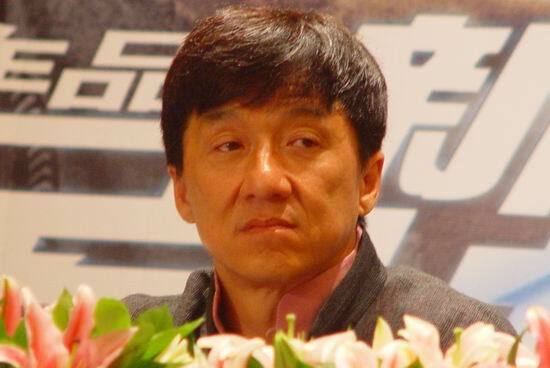 Jackie Chan has finished the shooting in Shanghai and Wuxi. His next destination is Gansu Province and then he will go to India." Thanks to Marie for the heads up on the above photos. 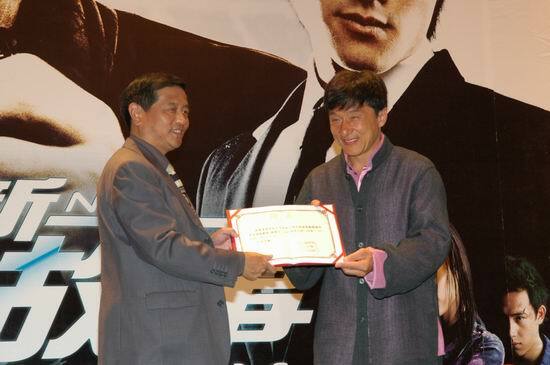 Jackie Chan accepts a silk banner from Baoding government of Hebei Province for his charity efforts there. 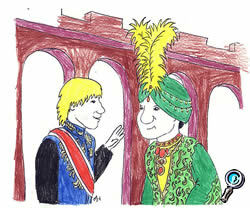 The Kids Corner Visits The Metropolitan Museum of Art in Jackie Chan Fan Land! Those of you who have been visiting the "Fun Stuff" section of the Kids Corner are familiar with the very strange place called "Jackie Chan Fan Land." Many wonderful things can be found there. In the latest installment of the visits to Jackie Chan Fan Land, the Kids Corner goes touring through the Metropolitan Museum of Art. Click below to see! 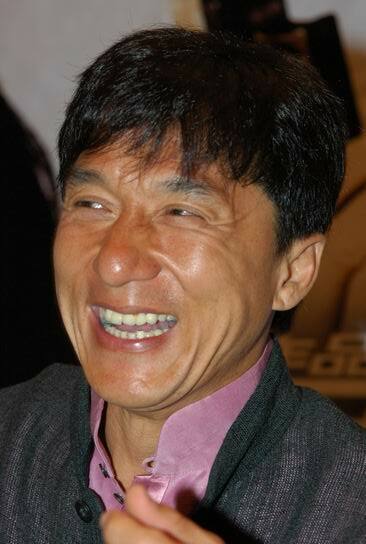 Visit the Metropolitan Museum of Art in Jackie Chan Fan Land! When you're done seeing the newest addition to the Fan Land series, why not go back and visit the others? Just click on the links below!